The story is mainly Irish in origin, with details from other sources. Although the many versions of the story naturally differ, the basic plot is much the same in all of them. Sir Tristram is sent to Ireland to bring Isolde the Fair back to Cornwall to be the bride of his uncle, King Mark. A potion that Tristram and Isolde unwittingly swallow binds them in eternal love. According to most versions of the story, after many trysts the lovers become estranged, and Tristram marries another Isolde, Isolde of the White Hands. 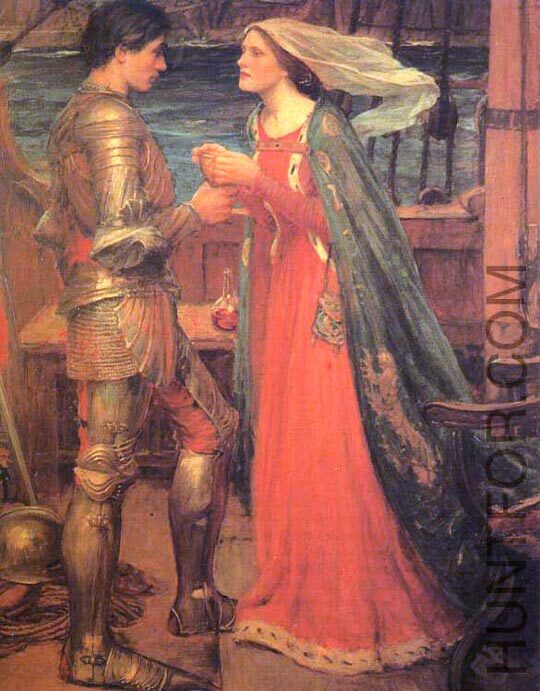 Later, dying of a battle wound, Tristram sends for Isolde the Fair. Deceived into believing she is not coming, Tristram dies of despair, and Isolde, on finding her lover dead, dies of grief beside him. The names of the two chief characters appear in various forms, such as Tristran, Tristrem, or Tristan and Isolt, Yseult, or Iseult.